Al Ahly thrashed Tunisia’s Etoile Sahel 6-2 on Sunday in the away leg at Borg El-Arab stadium to reach the final of the CAF Champions League. Al Ahly put six past Etoile to qualify for the CAF Champions League where they will meet Morocco’s Wydad Casablanca in the final. Al Ahly made it 1-0 on the first minute of the match, as Ali Maaloul scored a beauty from a direct free kick from the right side of the box. The Red Devils continued their sheer dominance over the game as Momen Zakaria went down the left flank to cross the ball inside the box for Walid Azaro to head in the team’s second on the 23rd minute. In the 39th minute, Maaloul made a beautiful one-two pass with Junior Ajayi on the left side of the pitch before Maaloul over lapped the winger to get in a cross to Azaro who headed in his second of the day. 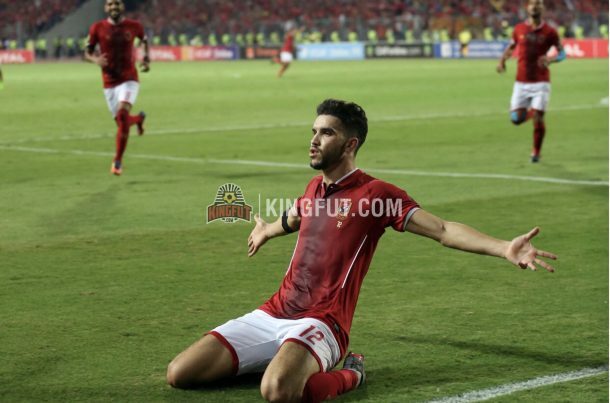 Al Ahly continued their helter skelter entertainment and as the second half kicked-off, Azaro tapped in Zakaria’s low cross to complete his hat-trick and the team’s fourth goal. Three minute later, Etoile pulled one back through Bedwi who latched in a cross from a foul from 25 yards out. Nothing stopped Al Ahly from continuing their reign over the game as they scored their fifth goal through substitute Walid Soliman who went on goal from the half-way line before being brought down by Etoile defenders on the outskirts of the box. In spite of going down, Walid’s ball went past Aymen Mathlouthi to get in. In the 70th minute, Ramy Rabia caught a loose ball to slot his powerful shot from outside the box into the net to make it six for the Red Devils. Iheb Msakni made it two for Etoile in the dying minutes after Sherif Ekramy failed to save his powerful shot from outside the box. To end the game 6-2 for the Cairo giants who go straight to the final. Al Ahly are set to face Wydad, who beat USM Alger on Saturday, in the first leg final in Egypt October 27 and will play the return leg in Morocco on November 4.